Why do people have to get into the path of totality? When you do see the eclipse from the path of totality, why does everyone seem to freak out? I saw mine for the first time in 52 years of life! I agree, it was AMAZING! But WHY? Maybe a quote from this article will help put it in perspective. This was from perspective of a group who had taken a plane up to see the Eclipse. At first the light seemed to dim almost imperceptibly but soon it was undeniable: day was turning to night. When the total eclipse was nearly upon us time seemed to speed up. Cameras clicked frantically; solar glasses were pulled on and off and then on again; faces of strangers were suddenly cheek to cheek, pressed against any window with a view. And suddenly we were there. “Totality! 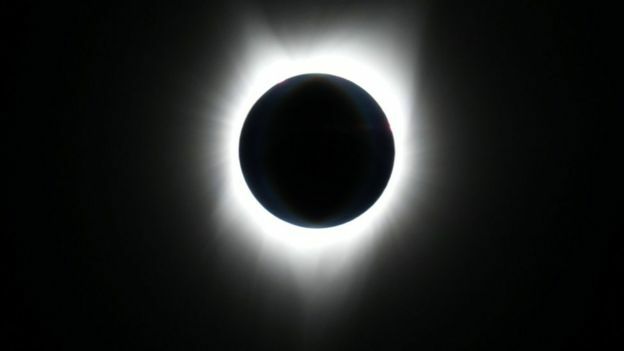 Totality!” came the excited announcement on the intercom and through the thick plastic windows on the right hand side of the aircraft the moon looked as if it were a tiny spherical pebble which had been hurled, with beautiful accuracy, straight into the gaping, glaring mouth of our star. “It’s incredible. It’s almost indescribable,” said Hannah Winit, struggling to put into words the glory and wonder that was unfolding in front of her. I personally cannot think of any better way to describe it with the exception of what the writer said Hannah was trying to put into words. Glory and Wonder! Psa 19:1 KJV To the chief Musician, A Psalm of David. The heavens declare the glory of God; and the firmament sheweth his handywork. Psa 24:7 KJV Lift up your heads, O ye gates; and be ye lift up, ye everlasting doors; and the King of glory shall come in. Psa 24:10 KJV Who is this King of glory? The LORD of hosts, he is the King of glory. Selah. Isa 66:18 KJV For I know their works and their thoughts: it shall come, that I will gather all nations and tongues; and they shall come, and see my glory. Isa 66:19 KJV And I will set a sign among them, and I will send those that escape of them unto the nations, to Tarshish, Pul, and Lud, that draw the bow, to Tubal, and Javan, to the isles afar off, that have not heard my fame, neither have seen my glory; and they shall declare my glory among the Gentiles. I could go on with ‘glory’ but I will stop there. It is in 371 verses in the KJV. I find myself pondering on the book of Exodus. Moses asked God to show him His glory. Perhaps, maybe, God is giving each of us an opportunity to get a glimpse into His glory? His power? Give us another opportunity to be sure we know Him or that perhaps we try to get to know Him while we still have a little time? Exo 33:18 KJV　And he said, I beseech thee, shew me thy glory. Exo 33:19 KJV　And he said, I will make all my goodness pass before thee, and I will proclaim the name of the LORD before thee; and will be gracious to whom I will be gracious, and will shew mercy on whom I will shew mercy. Exo 33:20 KJV　And he said, Thou canst not see my face: for there shall no man see me, and live. Exo 33:23 KJV　And I will take away mine hand, and thou shalt see my back parts: but my face shall not be seen. What a wonderful and awesome God! Loving and protecting! Praise His Holy Name forever and ever and ever!!! Thank you Jesus for saving us and calling out to us to turn from our wickedness and come to you! May this bless all who listen.